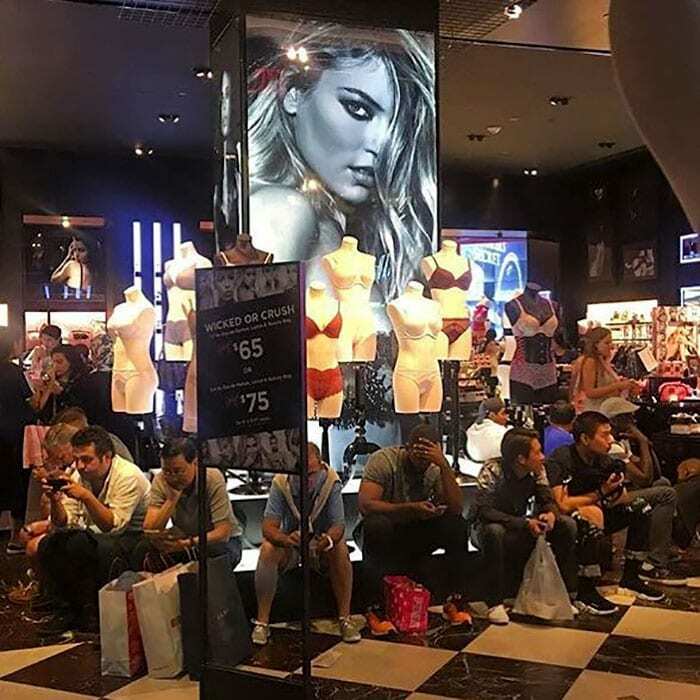 It’s the holiday season which means stores are going to be packed with people shopping for their loved ones. 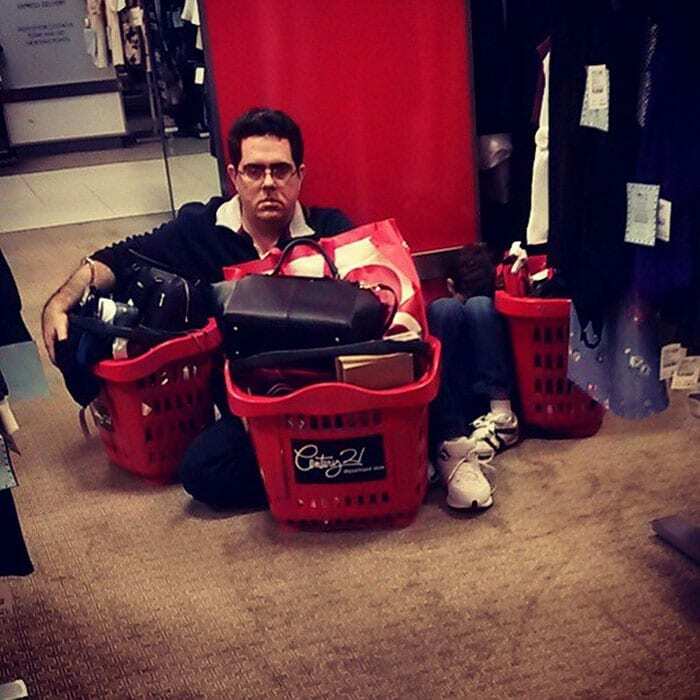 Some of us love shopping more than others. And some of us hate it. I mean really hate it. So much so that there’s an Instagram account about it. 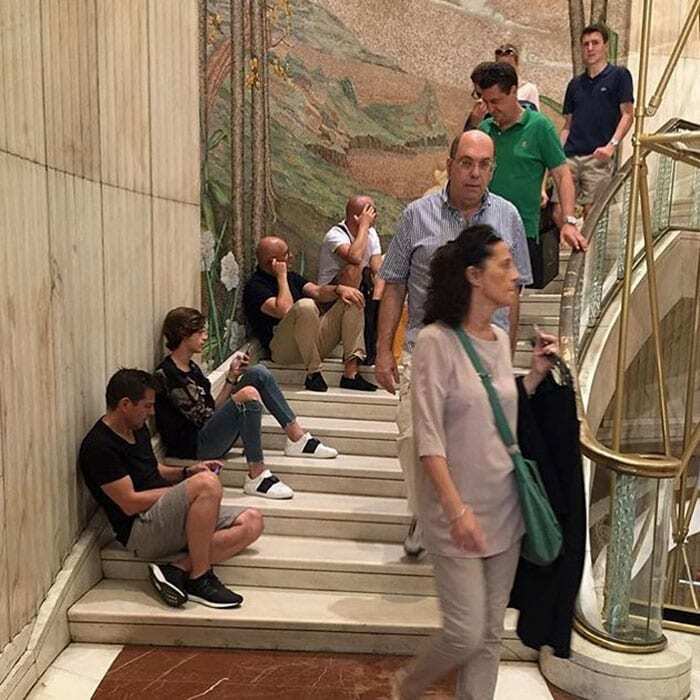 It’s called “Miserable Men.” A collection of photos that show boyfriends and husbands shopping with their significant others. And they look absolutely miserable. And it’s absolutely hilarious. 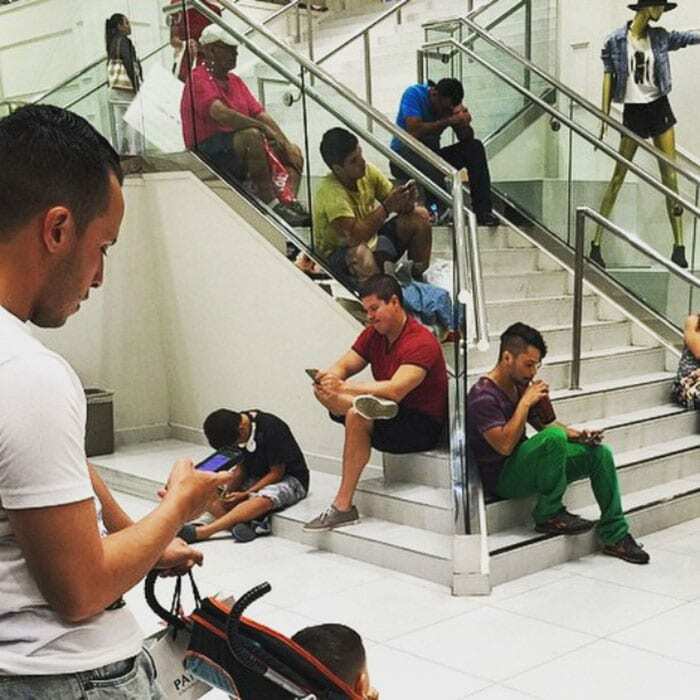 These poor men get dragged out into the malls and big box stores even though they can’t stand it… but they do it all for love. Look at this guy’s festive shirt. He’s all in the holiday spirit. He’s looks so jolly and thrilled to be there. This is the designated men’s dropoff section. 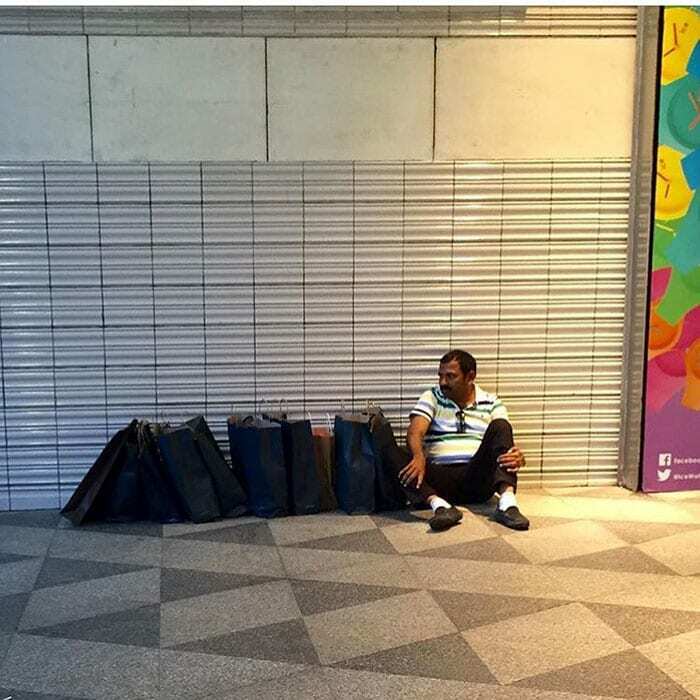 You can leave your man here with your bags while you go shop. 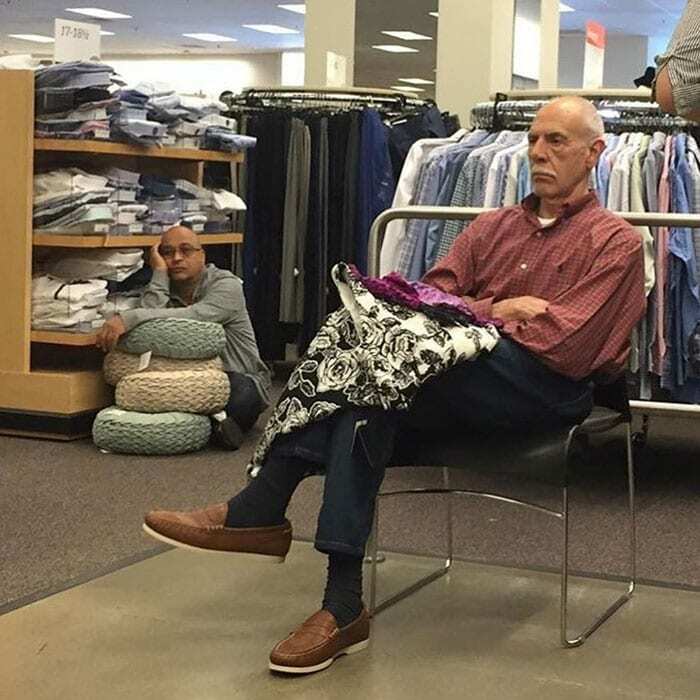 You can pick your man up when you’re done shopping. 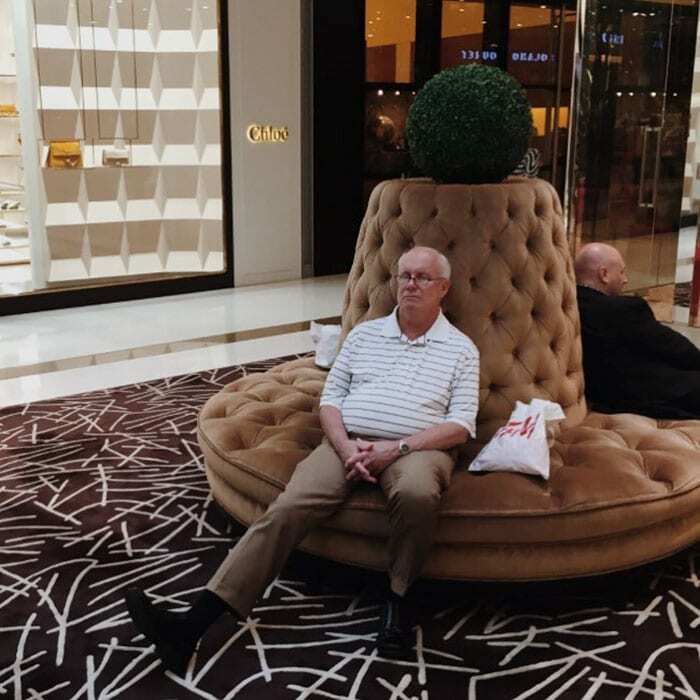 This man has accepted his miserable fate. So he’s just going to kick back and take it in. Wait until it’s over. These poor dudes at least found a comfy place to post up. One must have seen the other one doze off and followed suit. I love how they both have their mouths gaping open. This guy is snoozing away. And he does not care. 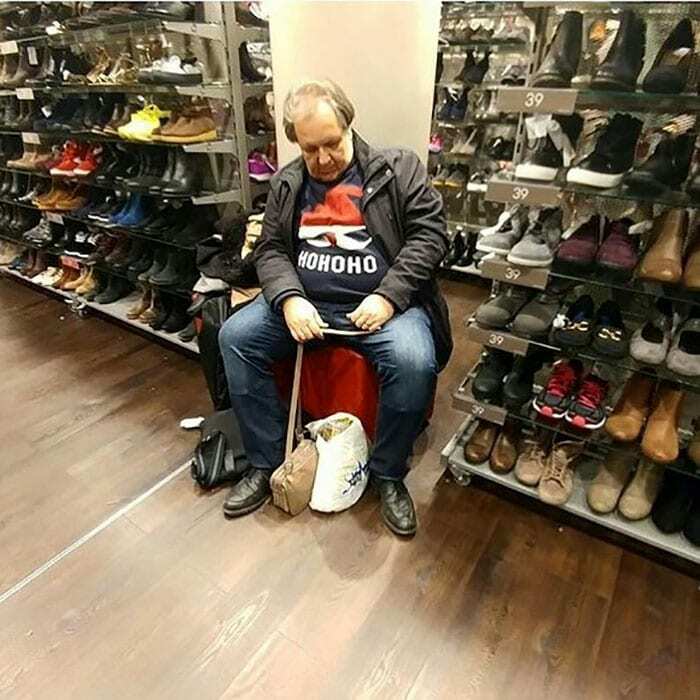 As long as the shopping is over when he wakes up. 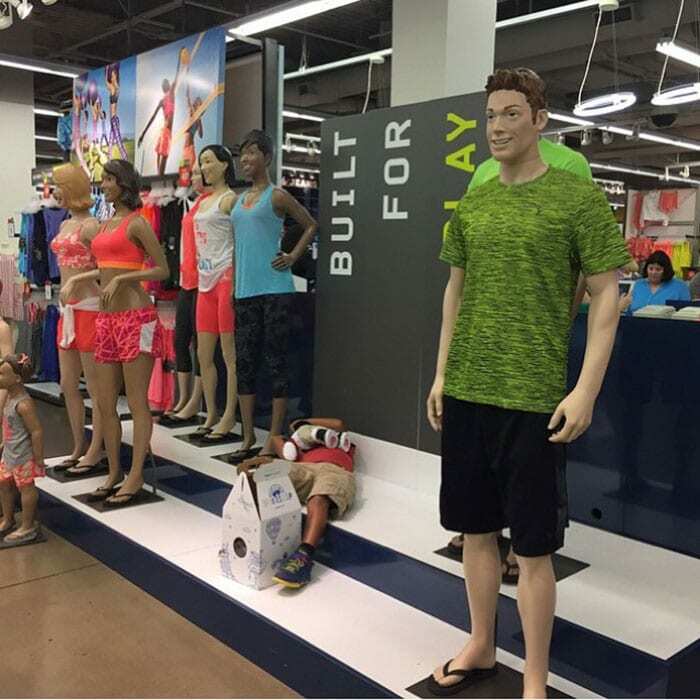 If this guy’s going to be stuck shopping, he might as well have fun doing it. This guy decided he would enjoy a little playtime. Why not? 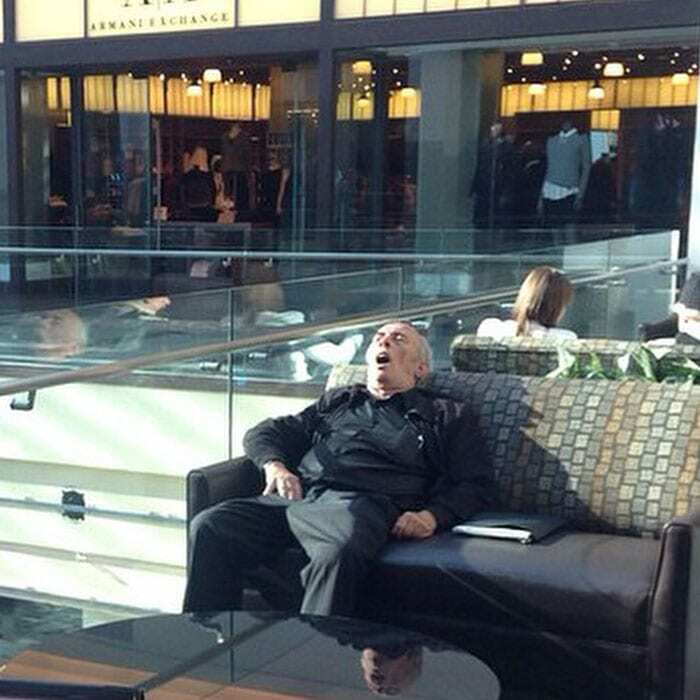 This guy is snoozing real hard. So hard that its reflecting everywhere. A snooze to reverberate through the ages. 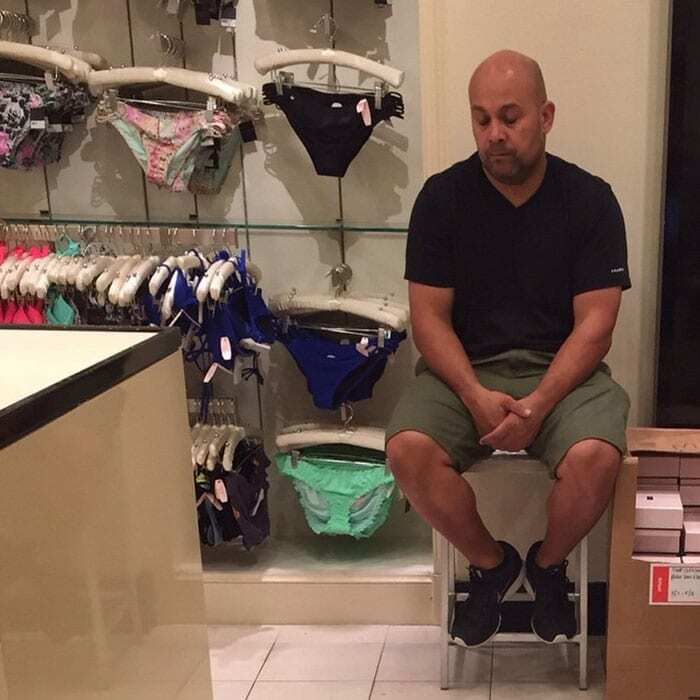 This guy wasn’t about to fret over being stuck on a shopping trip. He was going to make the best out of it. He looks pretty content actually. What does one do when they need the comfort of a pillow? But also the comfort of cuddling up? They side slump. These guys look like they are in their own person hell. 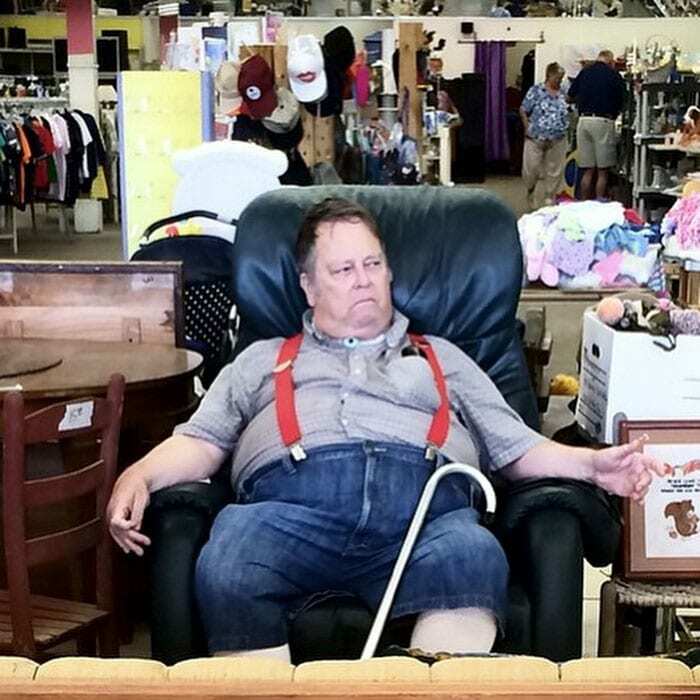 The dude in the chair looks straight furious. The guy on the floor is just waiting until his sentence is over. This guy looks like a real live wire. He looks so pissed, like he’s waiting for someone to mess with him. I wouldn’t. This poor husband is just sitting in the corner sulking. 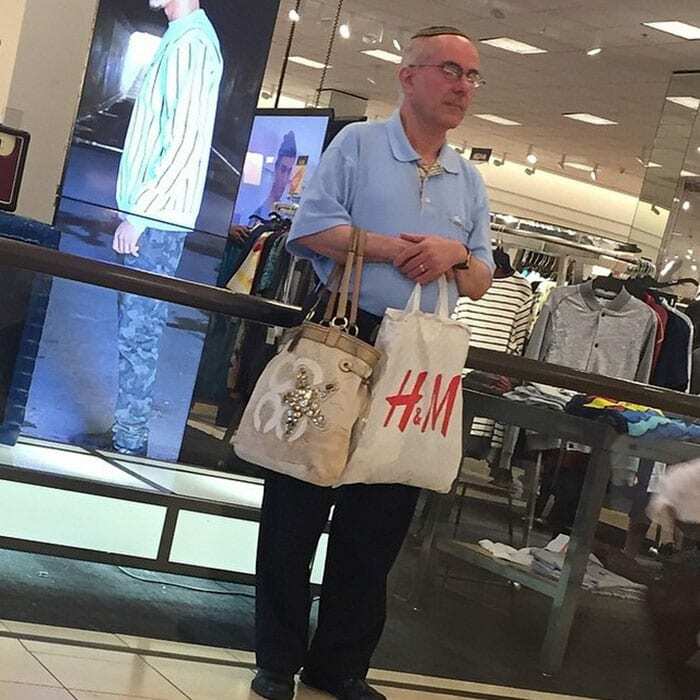 He’s even stuck with his wife’s purse. Just waiting… until it’s all over. 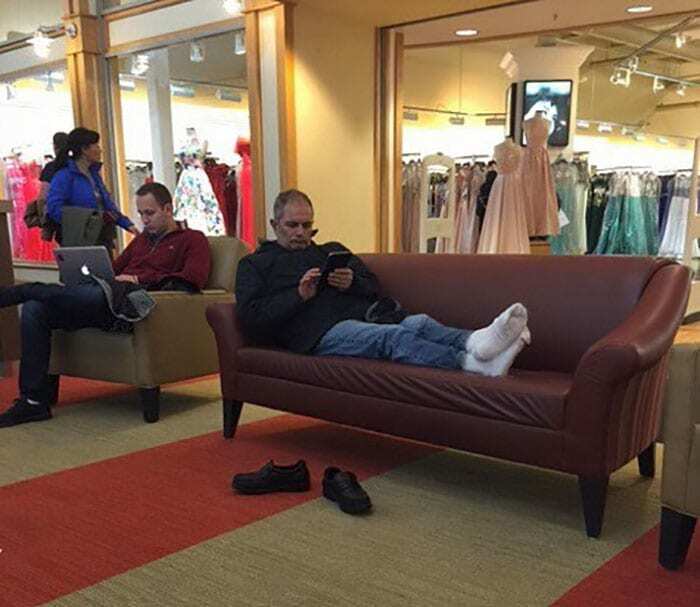 If this guy’s going to be stuck at the mall, he’s going to be comfy. 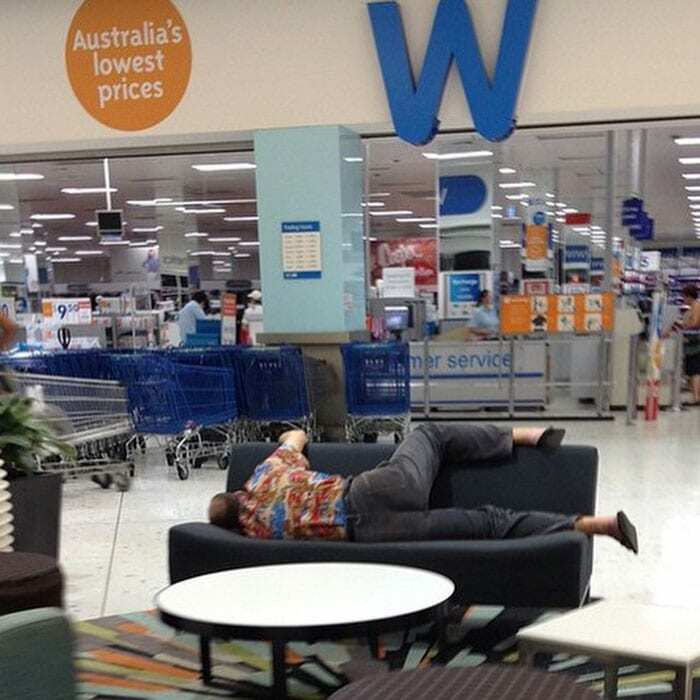 He’s just going to make himself at home. Taking his shoes off and everything. 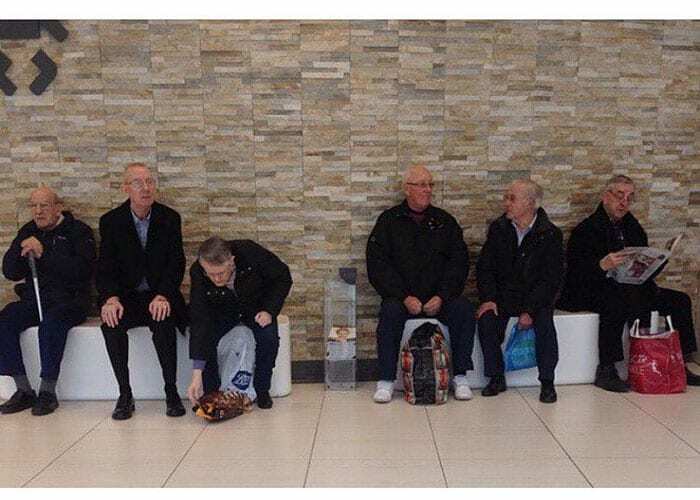 When you take men shopping, they are good for one thing. 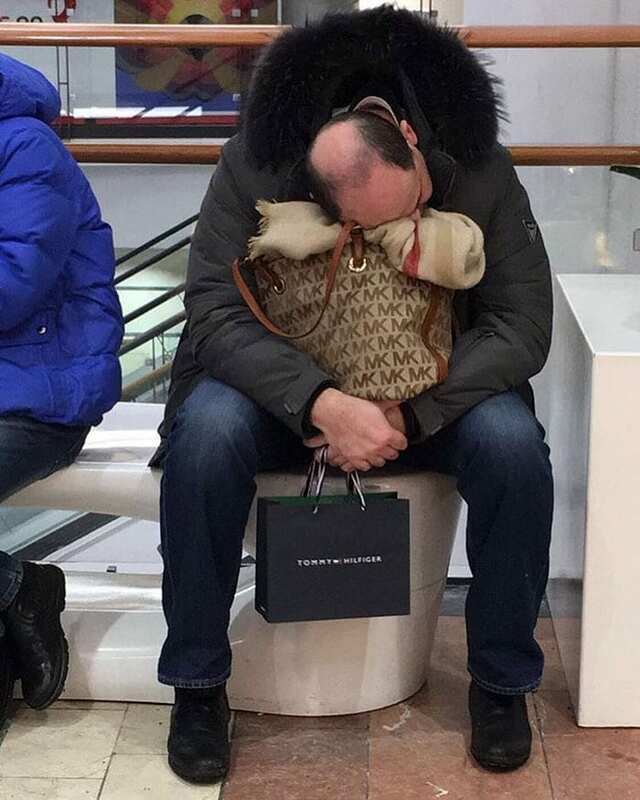 And this guy’s wife figured it out… holding bags. And he doesn’t look too thrilled about it. This poor guy is perched up. Looking all shameful. Surrounded by ladies undies or bathing suits. This guy has been sitting and the living room section so long he looks like he’s part of the display. It looks like someone decorated him. 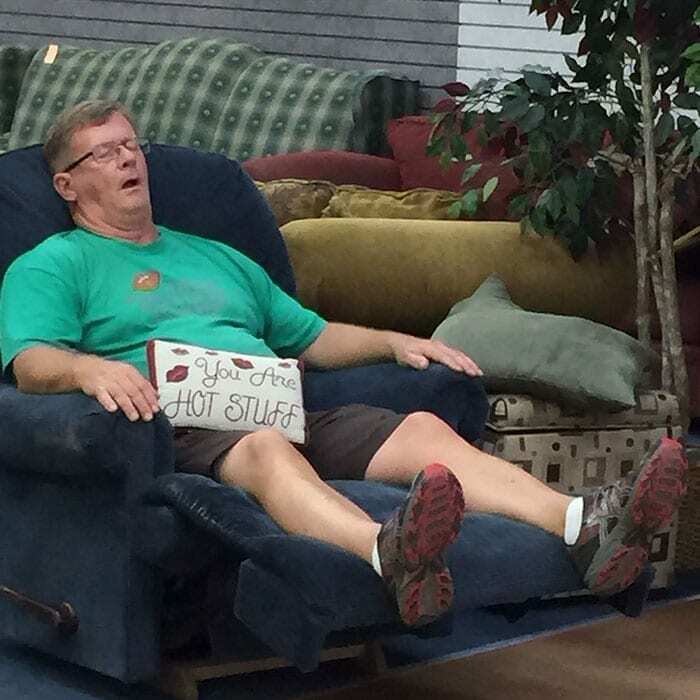 He gets thrown in when you buy a living room set. This guy is in perfect form. Perfect form for the most uncomfortable nap ever. He just looks so stiff. 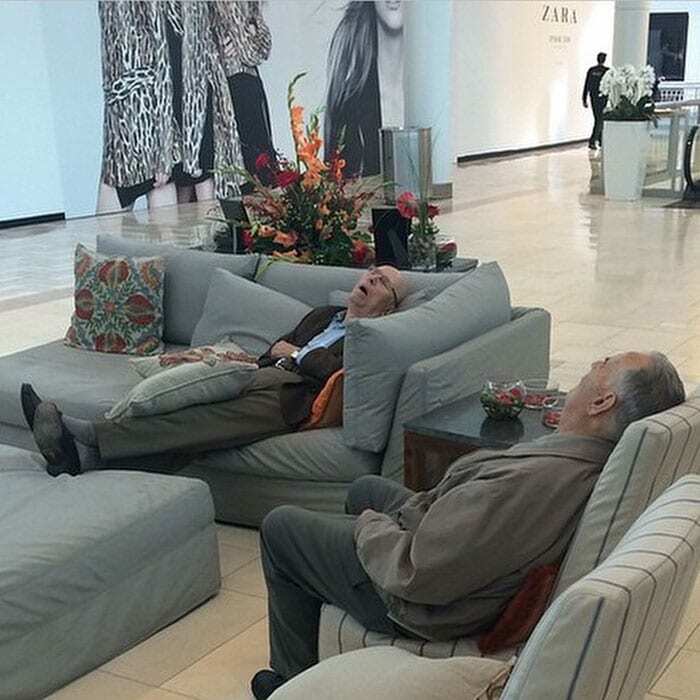 Apparently shopping companions have a uniform. It consists of a black jacket, black shoes, and shopping bags. They have to had planned this. Stair after stair, it just gets sadder. Filled with the tears and sweat of impatient bored men and boyfriends. Each one sadder than the next. 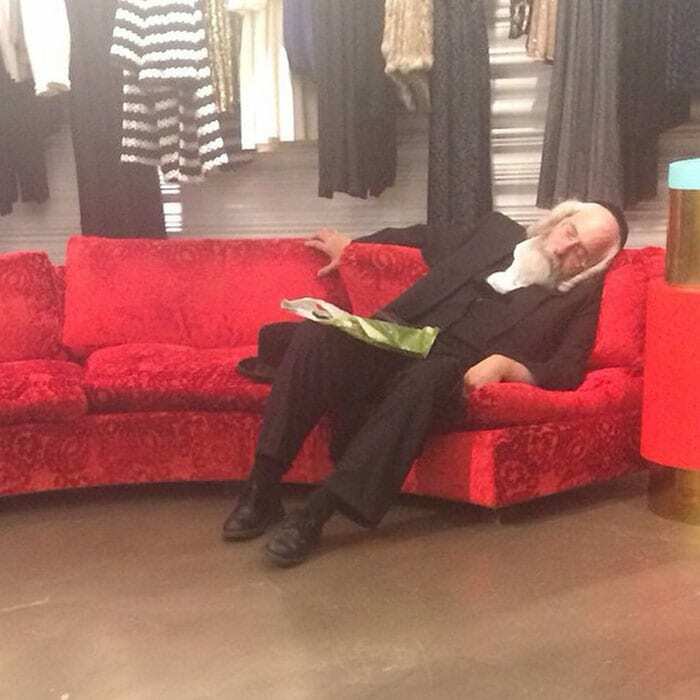 This guy is full out retaliating against this shopping excursion. So, he tossed his shoes off and jumped in bed. Did he take his pants off too? 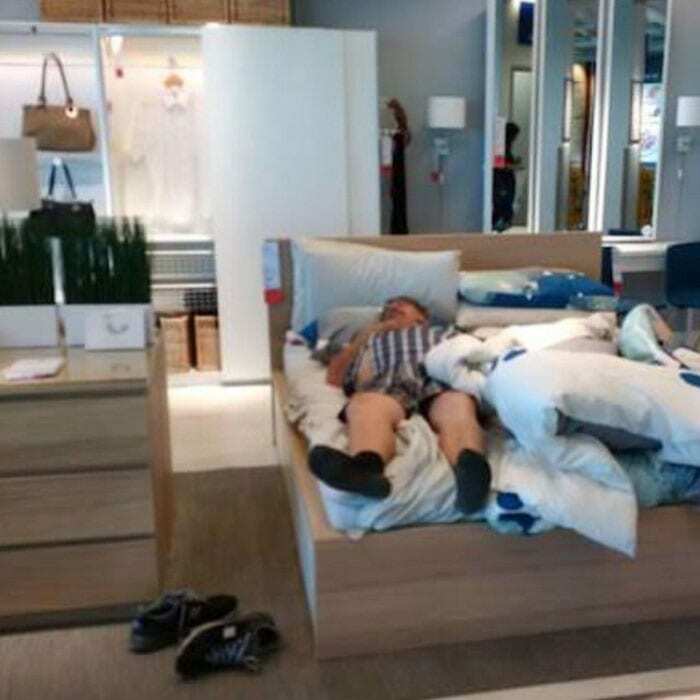 Can you imagine how pissed his wife will be when she finds him like this. 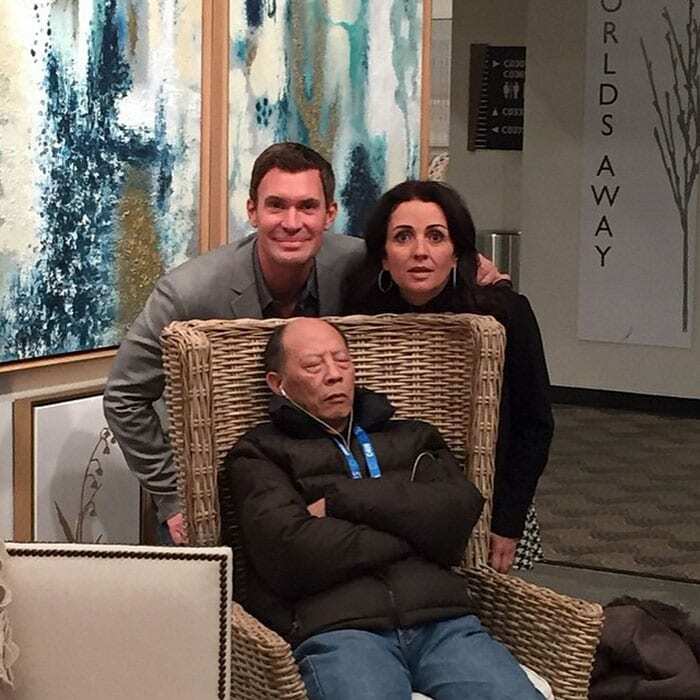 Here is Jeff Lewis and his former friend Jenni Pulos, both who starred in the Bravo show “Flipping Out.” They are posing with a very sleepy shopper. 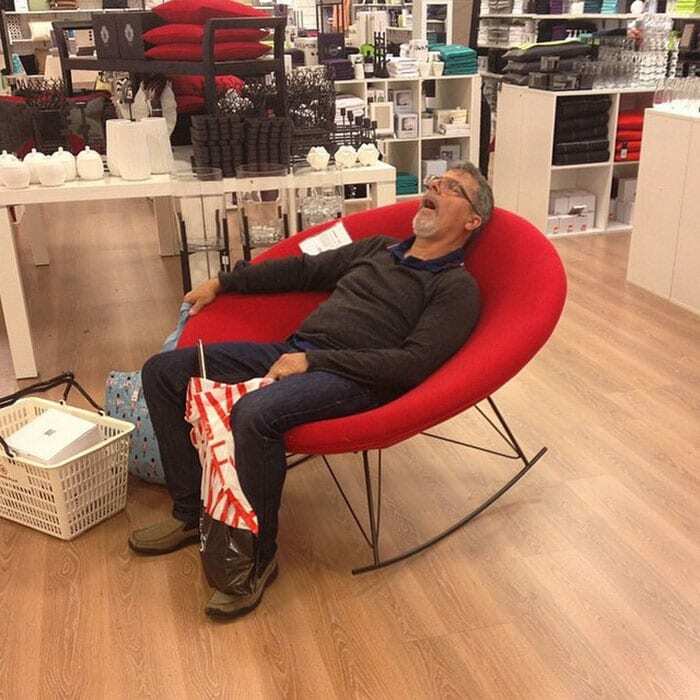 Well, husband who is accompanying his partner on a shopping trip. This significant other is still on duty. 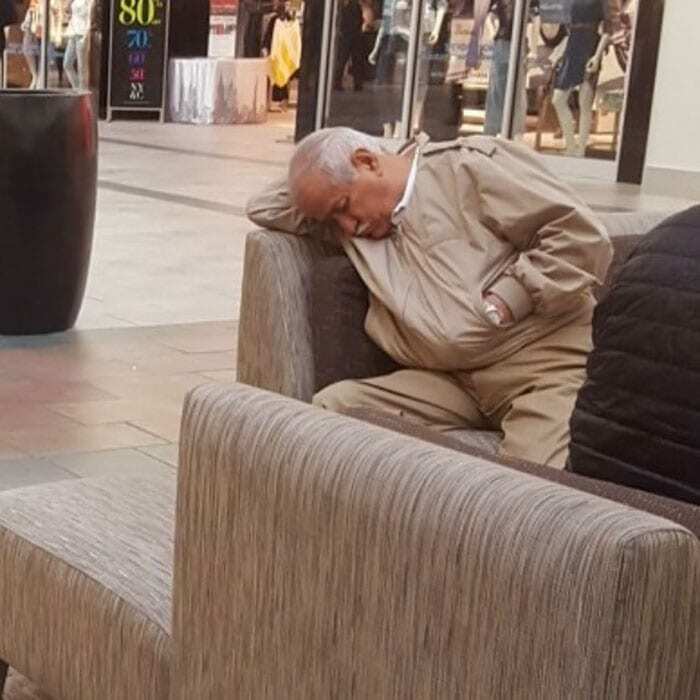 He’s just taking an on-duty nap. He is still guarding the bags and baskets though. This husband needs backup. How is he supposed to carry all these bags at once? Someone get him backup. 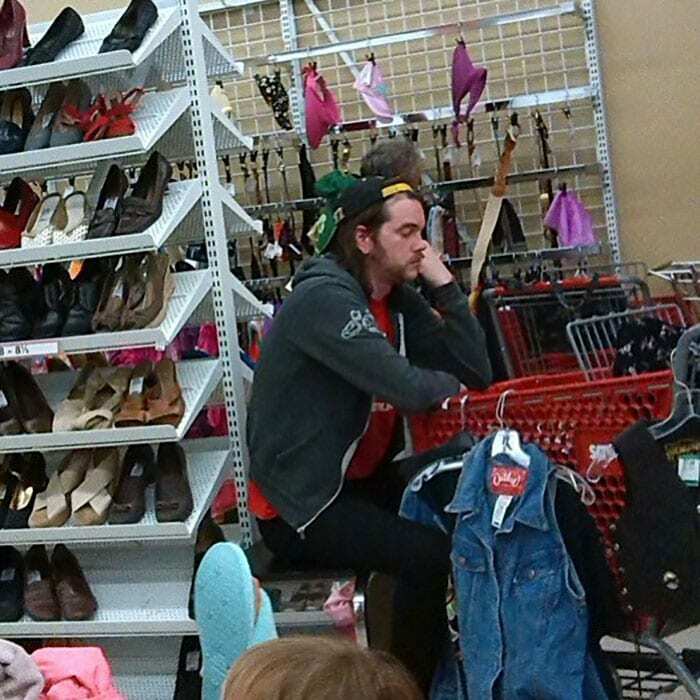 This guy has had a total shopping meltdown. He is in complete collapse. He has folded in over himself. Look at all these sorry saps. All in a row. Trying to scroll the time away. Also known as the curl over. It’s a gradual movement. You lean into it. There is no shame in this guy’s game. So he’s performing the shameless fallback. He’s just going to sprawl out where he pleases. 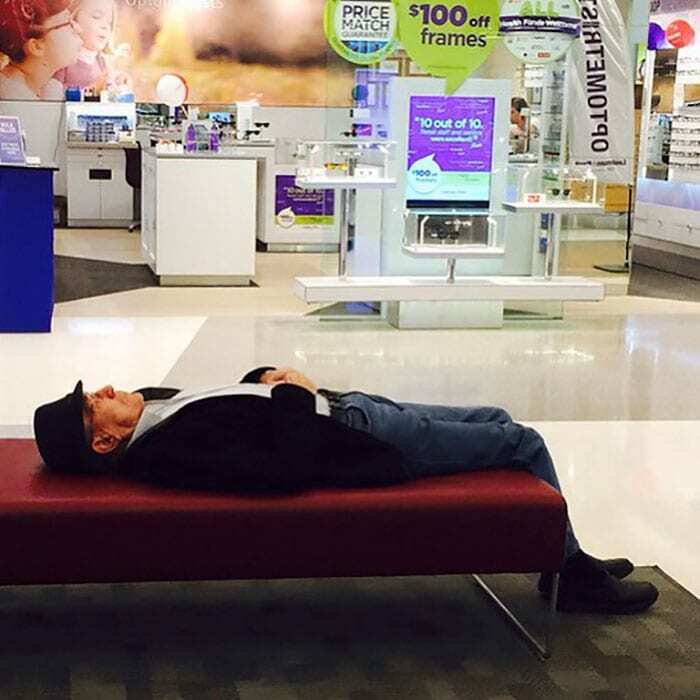 This guy decided to take a little snooze. But he must have forgotten that he isn’t home. 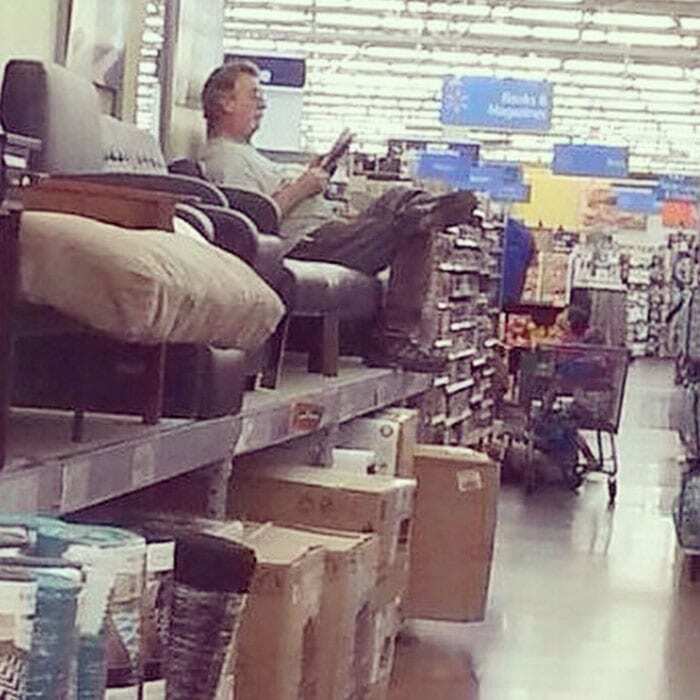 He’s got a leg up thinking it’s his wife or a pillow. Victory is not his. If fact, he looks pretty defeated. 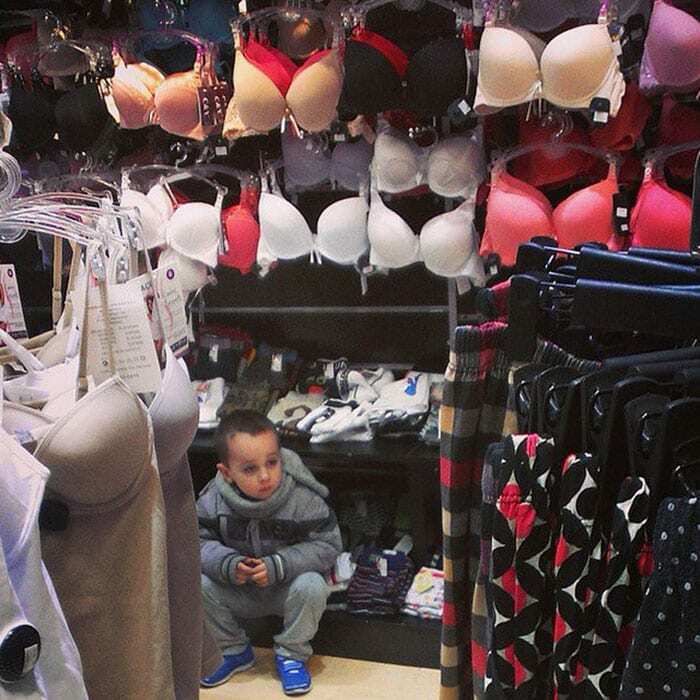 And like he’s contemplating all of his life decision that led him to this point. You can tell that he doesn’t want to be where he is. Especially with a purse in hand. But he’s doing it and not complainging because he loves his wife. This guy has accepted his horrible situation. So he’s going to slip into solace. The solace of sleep. 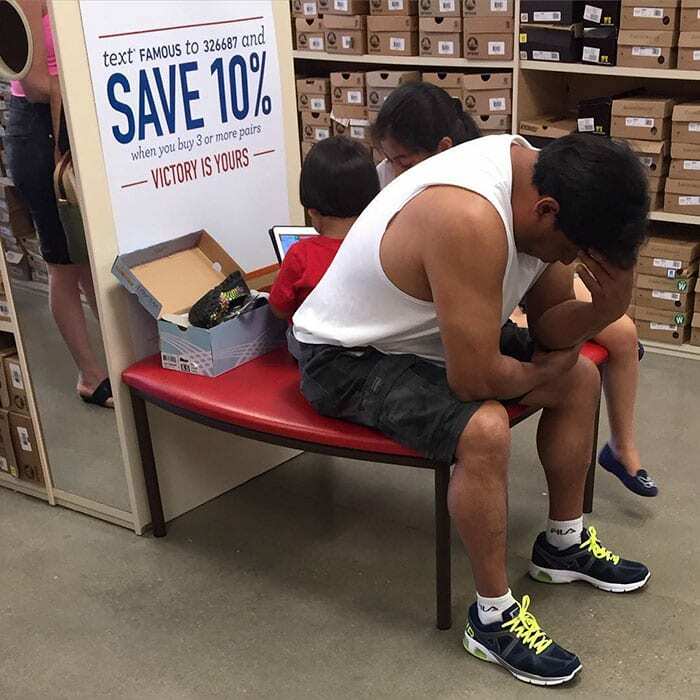 This is a sad shopping husband and boyfriend in training. He’s already got the natural instinct to assume a seated position. He’s going for the perch. 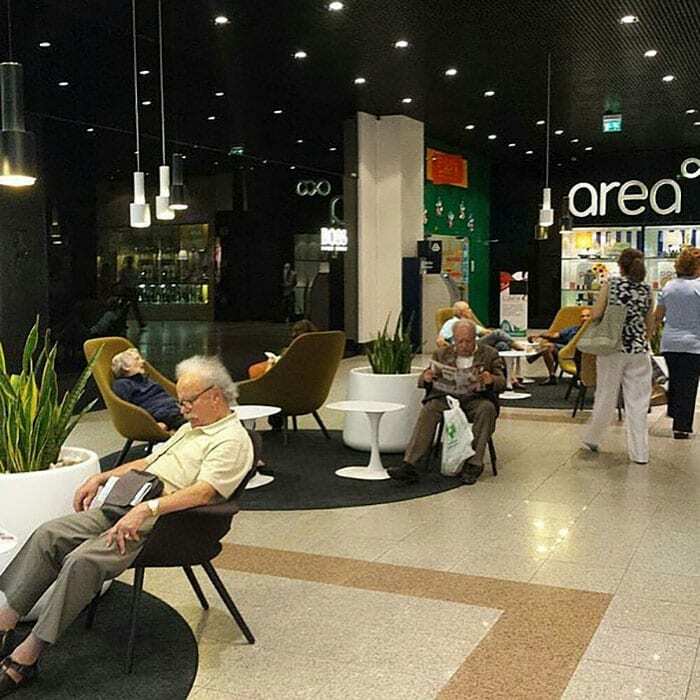 33) Home For Seniors Or Department Store? 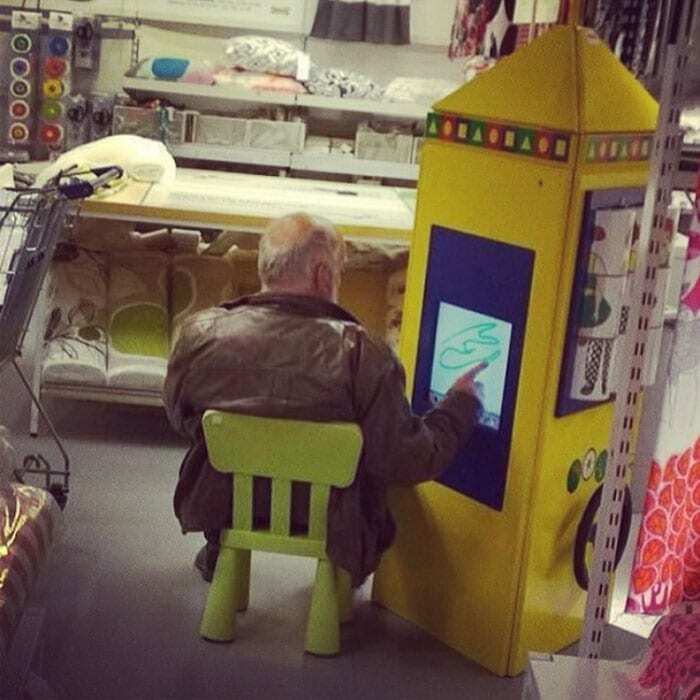 Is this a home for seniors? Or is it a department store? Its too hard to tell. 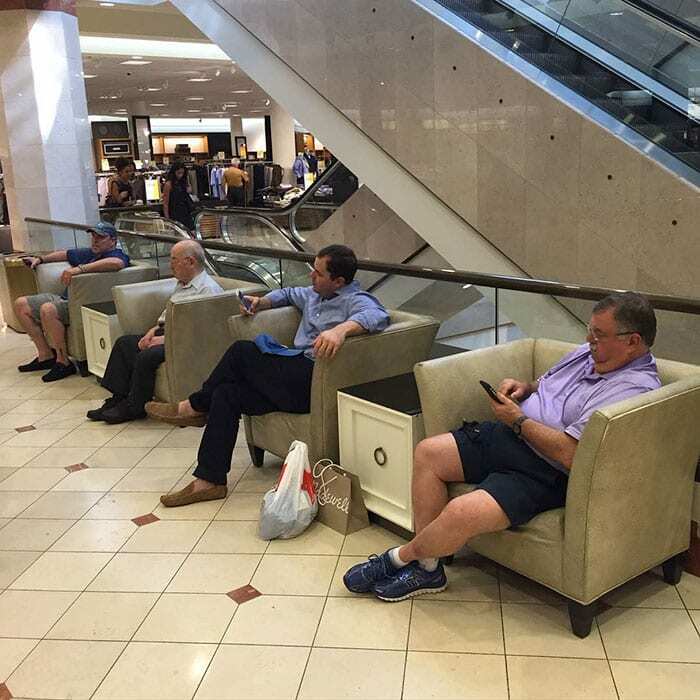 Here you’ll find men in the various stages of shopping companion depression. Some chomping at the bit with head between their knees. Some halfway to a side slump. Not even a beautiful woman could distract this man. Because life right now, is meaningless. 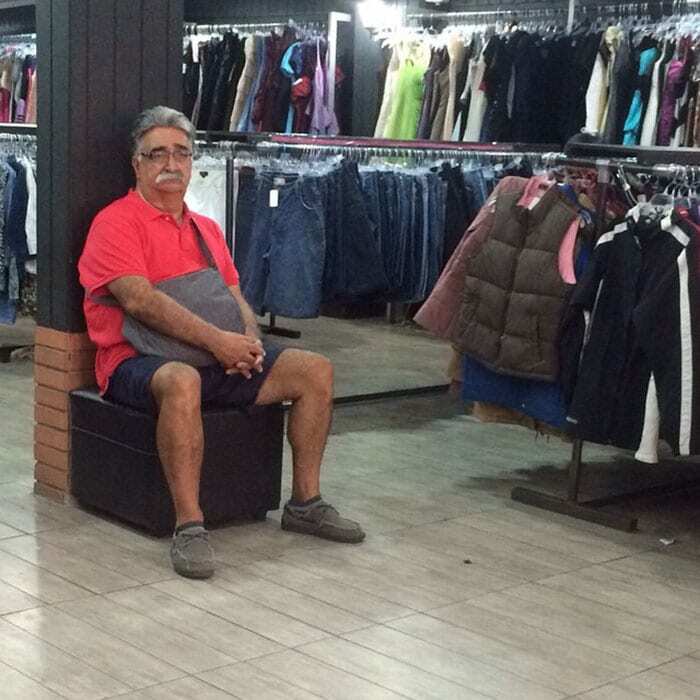 All he can do is stand in the doorway and wait until the shopping trip is over. This is what the agony of defeat looks like. He’s accepted it. Nothing to do except slump. 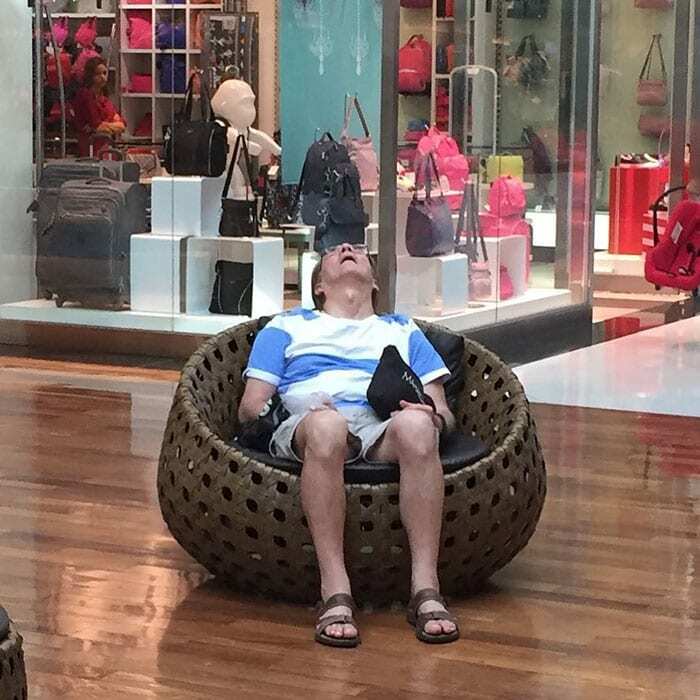 This guy is so bored. 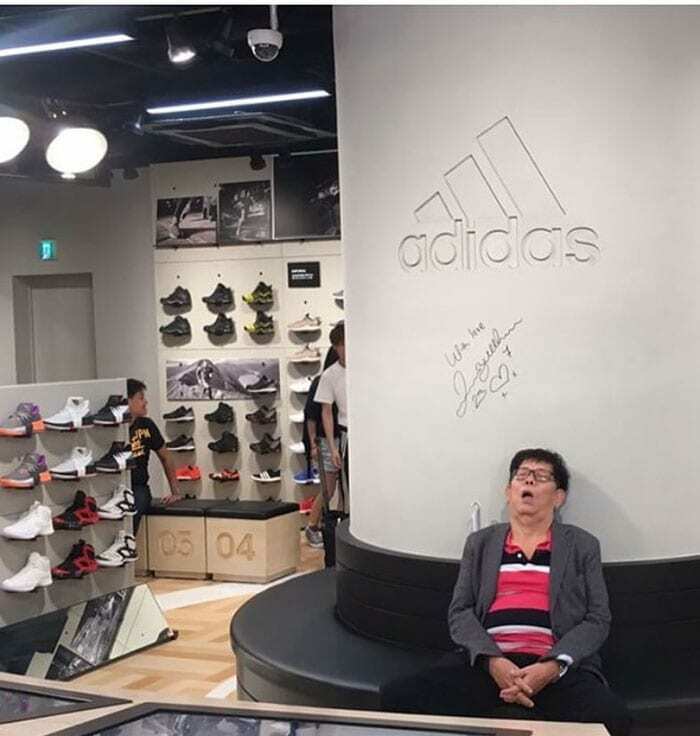 Now he’s in a shopping coma. Take this man home.